NB: Linked in Friday's Forgotten Books, 9/10/15. 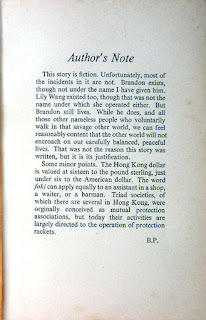 I've been on the hunt for a copy of the 1958 T. V. Boardman edition of Bryan Peters's Hong Kong Kill – the first in the author's very short series (in fact just two books) of Cold War spy thrillers starring British secret agent Anthony Brandon and American CIA operative Jess Lundstrum – ever since I got my hands on a copy of the Boardman edition of the second one, 1961's The Big H, three years ago. 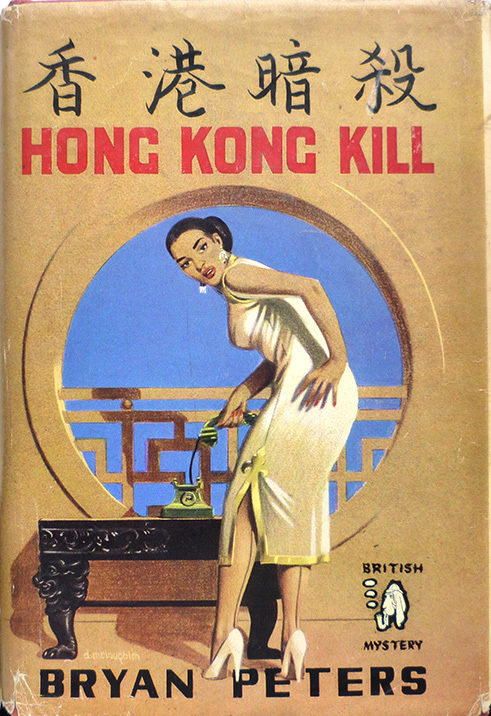 It wasn't merely the desire to complete a series which drove me to seek out Hong Kong Kill, nor the fact that like The Big H – and indeed almost all the crime and spy novels published under Boardman's Bloodhound Mystery banner – it boasted a dust jacket designed by Denis McLoughlin (although that was admittedly a major factor in my desire to obtain that particular edition); it was also my abiding interest in the man behind the "Bryan Peters" alias: Peter George. Best known as the co-writer of Stanley Kubrick's Dr. Strangelove or: How I Learned to Stop Worrying and Love the Bomb (1964), George published nine novels from 1952 to 1965 (including in 1963 a novelisation of Dr. Strangelove, which was itself based on George's 1958 novel Two Hours to Doom, alias Red Alert), both under his own name and the pen names Bryan Peters and Peter Bryant. 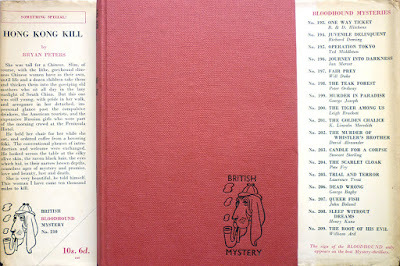 It's a fascinating body of work, comprising on the one hand a handful of straightforward crime thrillers, largely published in the 1950s, and on the other a succession of books from 1958 onwards all preoccupied to a greater or lesser degree with nuclear annihilation – an obsession which in 1966 drove George to take his own life. 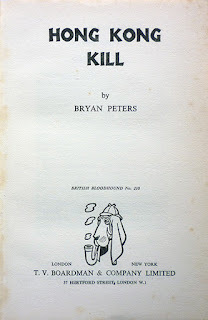 Somewhere in the middle are the two Bryan Peters spy novels – both of which touch on the threat of obliteration by intercontinental nuclear weapons (The Big H more so than Hong Kong Kill); and spy fiction being a particular passion of mine, and having already acquired (and read, and liked) The Big H, I was keen to get hold of Hong Kong Kill too. 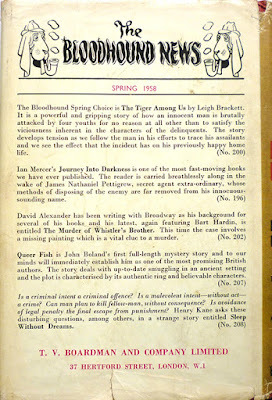 In the end I managed not only to find a fairly inexpensive, fairly decent copy of the uncommon Boardman edition – not ex-library and with a dust jacket that, while edge-worn and chipped, is still bright and presentable (now added to the Denis McLoughlin section in Beautiful British Book Jacket Design of the 1950s and 1960s) – but one which, unusually, is inscribed by George. 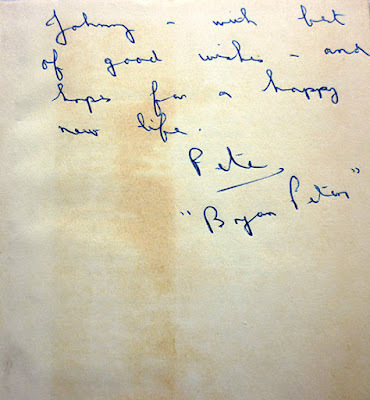 Signed or inscribed Peter George books really aren't too common; I own an inscribed copy (on an author bookplate) of George's final and perhaps finest novel, Commander-1 (1965), and there are two other signed George books that I can see for sale online at present – one an inscribed copy of his 1958 crime novel Cool Murder priced at £70, the other an inscribed copy of Two Hours to Doom priced at £1,250 – but that's about it. Johnny – with best of good wishes – and hopes for a happy new life. 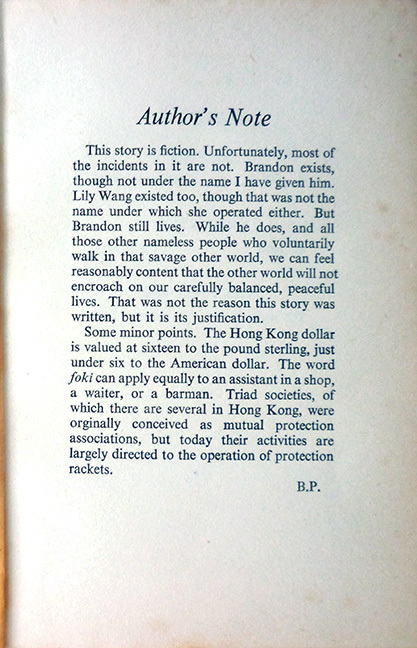 As to the novel itself, it's a good but uneven affair – a trifle flat in places, melodramatic in others, with a very dry first third ("The Briefing"; the novel is split into three parts, the other two being "The Kill" and "The Prize") which establishes the background to British Intelligence agent Brandon's mission – to travel to Hong Kong in order to thwart the nefarious activities of the Chinese "Extermination Section" Yellowknife, which is poised to foment trouble and assassinate key individuals – in a little too painstaking detail, and a colonial bias which is a little hard to take nearly sixty years hence. 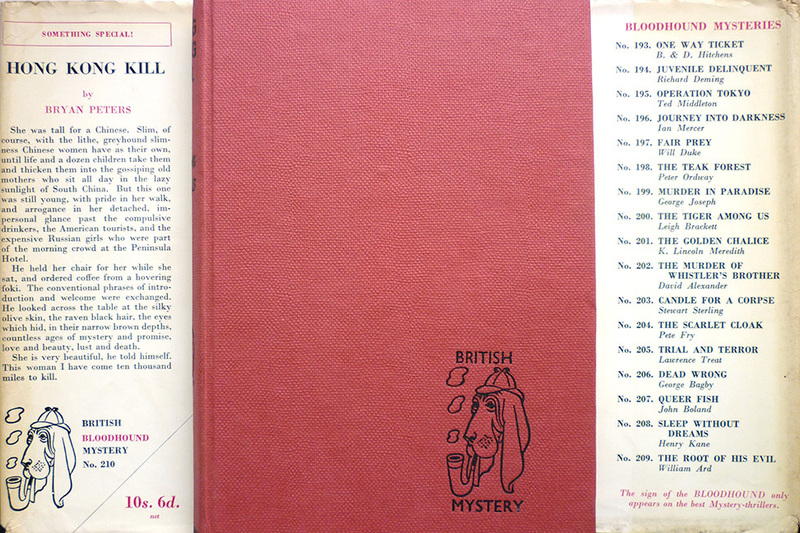 But there are some classic bits of Fleming/Bondesque spy business in the thing: a doomed love affair; a high stakes game of seven-card stud; coded messages conveyed via books (namely, amusingly, Conrad's The Secret Agent and Waugh's Decline and Fall). And it explodes into vivid, evocative life in the final part, as the 1956 Kowloon Riots erupt and Brandon and CIA agent Lundstrum go on the hunt for Yellowknife leader Lily Wang, with some shocking bursts of violence and corpses piling up in the streets around the two leads. This story is fiction. Unfortunately, most of the incidents in it are not. Brandon exists, though not under the name I have given him. Lily Wang exists too, though that was not the name under which she operated either. But Brandon still lives. While he does, and all those other nameless people who voluntarily walk in that savage other world, we can feel reasonably content that the other world will not encroach on our carefully balanced, peaceful lives. That was not the reason this story was written, but it is its justification. Wow. I've never even heard of this. Sounds right up my street. 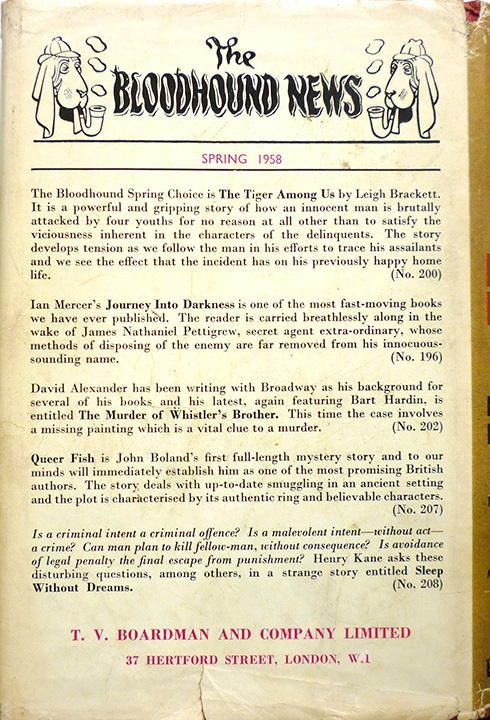 Also, 1958 sounds early for that sort of a plot. 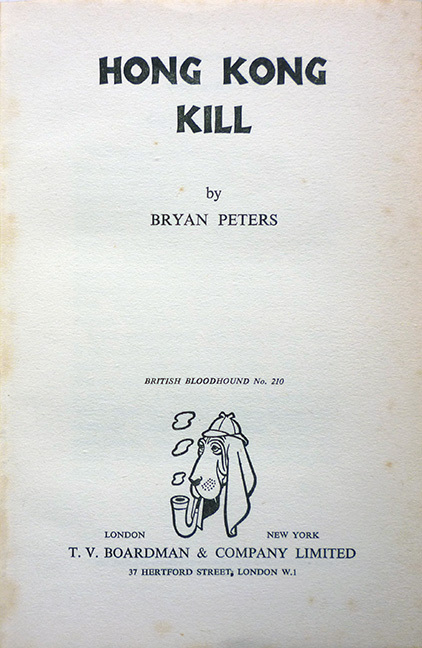 Both of the Bryan Peters spy novels are worth a look, Jeremy. They're not top notch spy fiction, but they're pretty good, and George was an interesting guy.